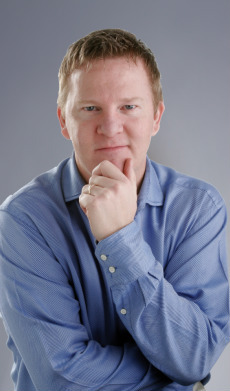 Michael Ross is an award-winning journalist and former editor of Breakaway, a national magazine for teen guys published by Focus on the Family. He is also the author, co-author, and collaborator of more than 31 books for Christian families, including the Gold Medallion winner BOOM: A Guy's Guide to Growing Up (Tyndale), a bestselling parenting guide What Your Son Isn't Telling You (Bethany House), and his latest release with Arnie Cole TEMPTED, TESTED, TRUE: A Proven Path to Overcoming Soul-Robbing Choices (Bethany House). Michael and his wife Tiffany live in Lincoln, Nebraska, with their young son Christopher and two cats. Today, he oversees Back to the Bible's book publishing efforts. Michael studied journalism and art at Humboldt State University. After college, he began his writing career in Los Angeles—where he spent countless hours working with inner-city youth and their families. These experiences sparked in him a heart for disadvantaged teens. In 1990, he co-founded Breakaway (a national magazine for teenage boys). In 2002, he and a team of wilderness guides began taking readers on summer backpacking excursions near Yosemite National Park. And three years later, Michael launched Breakaway's Father-Son Adventures in Colorado. Under the guidance of Noah's Ark Whitewater Rafting Co., these backcountry trips were designed to strengthen relationships between dads and their teenage sons. When Michael isn't writing or speaking to teens and their parents, he and his family love adventure travel. Their most memorable trip is a safari through Zimbabwe by motorcycle (with a bunch of teens, of course), and then by boat down the Zambezi River. The author and his wife and son are currently dreaming up a fiction series that will take young readers deep into African jungles and zigzagging down churning mountain rivers--adventures they will research together! During Michael's publishing career, he has written and edited thousands of articles and has interviewed hundreds of athletes, musicians, actors, as well as amazing people from all walks of life. Some of his most memorable interviews include: actors Sylvester Stallone and Stephen Baldwin, director Catherine Hardewicke (Twilight, Lords of Dogtown), teen superstars Jonas Brothers, CCM artists Kirk Franklin, Skillet, and Steven Curtis Chapman, country music band Sawyer Brown, Indianapolis Colts' Hunter Smith, and UFC fighter Nathan "Rock" Quarry. Read more about Michael at www.mrossbooks.com.